Joanna Newsom, Iris DeMent, and Elena Ferrante: Three women performing vanishing acts in order to be seen more clearly. On her new album, Joanna Newsom—like writer Elena Ferrante and country singer Iris DeMent—performs a vanishing act, in order to make her audience see her more clearly. Photo illustration by Juliana Jiménez. Photo by Earl Gibson III/WireImage. 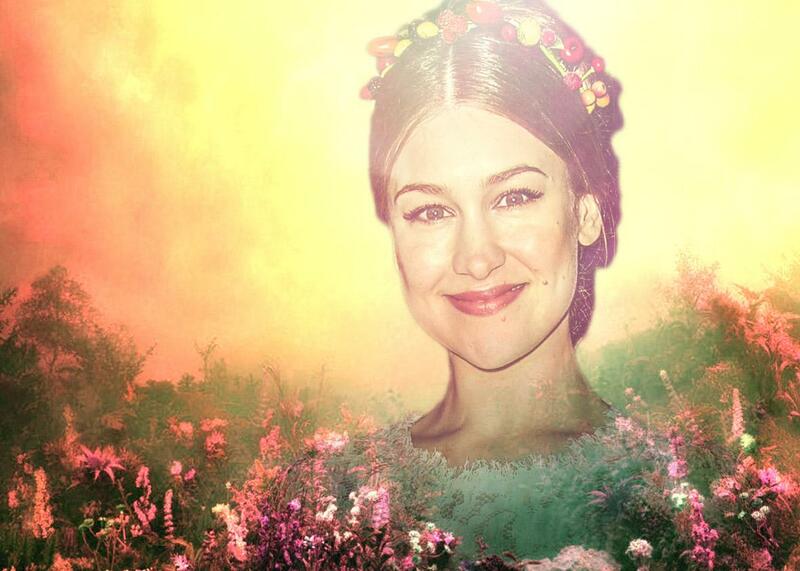 Something happens on the front of the much-praised new album by Joanna Newsom, Divers. Unlike on her previous three, the cover of the 33-year-old singer-composer’s first record in five years does not include a picture or portrait of her, nor anyone: It is a lush landscape of wildflowers and cloud cover, with nary a figure to be seen. It reminds me in a way of the widely despised covers of Italian novelist Elena Ferrante’s otherwise acclaimed, recently completed series of “Neapolitan novels.” Critics have called the look of the English-language editions cheesy and kitschy, like “Hallmark cards or bad romance novels.” Booksellers have told me they’ve seen straight men hesitate to pick up the books and ask girlfriends or wives, “Why don’t you buy it and I’ll borrow it?” The publishers themselves have said they are playing a “game” of “dressing an extremely refined story with a touch of vulgarity,” suiting the books’ main setting, an impoverished and brazenly uncouth district of Naples. 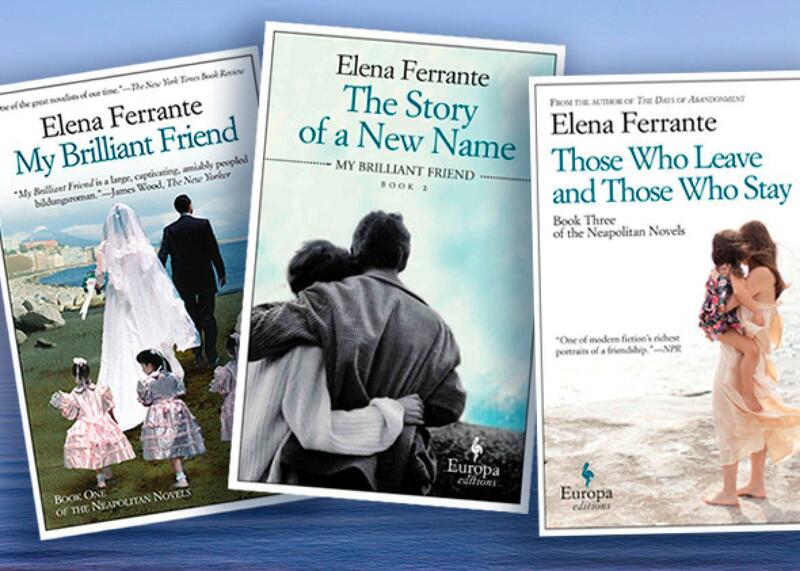 Like their author, then, who famously keeps her real-life identity a secret, Ferrante’s books wear a disguise. But it is an evasion that also imparts a truth. Their epic story is a work of melodrama, crime fiction, neo-realist history, romance, political intrigue, social theory, and psychology. But it is also what’s traditionally called “women’s fiction,” in that the domestic and personal struggles of the female leads are its paramount concern. So if the quartet is draped in that genre’s conventionally “girly” costume, whose problem is it, except anyone who doesn’t believe that women’s stories are as real and meaningful as men’s? Rather deliciously, the designs require men (and other snobs) to submit to some potential minor social embarrassment to partake of the books’ riches. That honest camouflage is of a piece with Ferrante’s pseudonymity, her self-described “structural absence.” As she observed as a young reader of Jane Austen, that withdrawal has many advantages for a female artist. For one, it resists the common reflex to treat women’s creations as merely confessional or, at best, side effects of character, to be judged more socially and morally than artistically. Removing her mundane self from consideration means the work can be “intensely, violently personal,” yet remain privately so. Which is to say, genuinely public. On Divers, without taking it quite so far, Newsom carries out a similarly shrewd self-effacement. The reception of her last album, Have One on Me, was clogged with gossip that it was an account of her breakup with the older, brilliantly dour songwriter Bill Callahan and her new relationship with the (brilliant in his own way) Saturday Night Live comedian Andy Samberg, now her husband. Even before that, she’d had to contend with reductive caricatures due to her California-counterculture background, esoteric lyrics, atypical voice, and use of a concert harp as her primary instrument. She’s often portrayed either as a twee, “elfin” hippie chick or as an “ethereal” harp-and-heart-strings-plucking siren; several Divers reviewers have pointed this out, but often with such emphasis as to perpetuate it. (Granted, some of her fans share the blame.) And now she had been velvet-roped into the shooting range of the paparazzi, too. So the aspect of Newsom removed as irrelevant this time is … all of her? Or all except the elements that are metaphorically, or by some chain of subatomic or spiritual connection, wildflowers and clouds? Perhaps. Newsom’s verse always has recalled the nature-drunk zeal of the Romantic poets, albeit with better jokes. There is a hidden joke here, too, since the image is not of an actual location, but one of New York artist Kim Keever’s constructions from plaster, cotton fluff, and paint, photographed suspended in an aquarium tank of water. Thus Newsom’s narrator is at once an anonymous abundance and a created façade, a sense of place without a place, an omniscience and an absence. But that is fitting, because the theme of the album formally is nonlinear time, and also, as she’s put it, “what’s available to us in the human experience that isn’t subject to the sovereignty of time.” Its scope runs backward before alpha and on beyond zebra, to the entropic expiry of the universe or its cyclical recreation, who knows which. These matters are addressed lyrically in theories, tales, and aphorisms. But they’re also reflected structurally, with melodic and imagistic material mirroring between songs, and the whole forming a circle: Divers starts and finishes on the same sustained note, and leaves off in the middle of a word (trans-) that is completed by the first syllable of the first song (-send). That final song, “Time, as a Symptom,” signals the gambit by quoting the line that forms a similar loop at the closing and opening of James Joyce’s Finnegans Wake. Joyce’s title for his first sketch of the Wake was “Here Comes Everybody,” and the “divers” of Newsom’s title are the equally multitudinous figures in its songs, diving every which way: They plunge into the sea, plummet out of airplanes, dig into the dirt (or the archives), fall in and out of love, slip from the womb, belly-flop on battlefields, swoop down as myriad species of birds (including a vaudevillian-sounding character named Rufous Nightjar), and rise again as quantum particles flitting through dimensions—all of them, all of us, helplessly tumbling in the backdraft of ungovernable time, in who-can-say-which direction, leaving who-can-say-what trails? That all sounds heady, and it is. But it is not suffocating. Musically, Divers could not be more lively, nor its creator more fully present in her craft. Have One on Me was more sparing in style, suiting its heartbroken themes. But it was also a triple album, which felt to me as if, like a misguided city planner, Newsom had forsaken density for sprawl. Divers, by contrast, is the most perfectly measured album of her career. It is verbally and musically ever-mobile, full but never cluttered. Its sound centers on her leaping and insinuating vocals, more versatile than ever, which fly acrobatically above her rivers of dazzling contrapuntal harp runs and imbricated layers of piano and analog synthesizers. Other instruments (orchestras, birdsong, musical saw) come into view at select moments, for texture, for rhythm, and for climaxes. It commands my attention in every second. In these moments the preoccupation with time also seems to be about coming into fully fledged adulthood, all too aware of youth passing into retrospect, of the ultimate threat of mortality, and of the complicated choices to be made in-between—including where to settle (“Leaving the City”) and (most conspicuously in “Time, as a Symptom”) what it might mean to bring a child into the flux of time with you. That tone, which I’d describe as an ecstasy of ambivalence, connects Newsom’s work for me to one of the other most gorgeous albums of this fall, Iris DeMent’s The Trackless Woods, which relies for its effect on another feat of identity displacement. DeMent is a country-folk songwriter with an arrestingly individual voice—no less an eminence than Merle Haggard once called her “the best singer I’ve ever heard”—and she made a few of the finest country albums of the 1990s, including the outright masterpiece that is 1993’s My Life. But her issues with depression brought on a chronic case of writer’s block, and in the past 19 years she’s produced only one album of original songs, 2012’s Sing the Delta. In 2004, however, she turned for succor to her abjured Pentecostal family roots and released a beautiful set of traditional Southern hymns called Lifeline. On The Trackless Woods, she returns to that well, using those songs’ melodic style and modestly enhanced family-piano-style arrangements, but she matches them with an unexpected partner—the poems of the great 20th-century Russian poet Anna Akhmatova. DeMent encountered Akhmatova’s verses almost by chance four years ago and immediately felt a kind of call, as if from an unseen force: “I felt as if somebody walked in the room and said to me, ‘Set that to music.’ ” This album, then, finds DeMent borrowing someone else’s voice in order to help her rediscover her own. (On the record cover, appropriately, we see only half of DeMent’s face.) The two summon up a kind of third entity that sounds nothing like anything DeMent, or anyone, has done before. And the melodies are so catchy that you’re likely to find yourself joining in, then stopping to wonder, Wait, what on earth am I singing? The uncanny yield of these homespun sounds, crossbred with sophisticated sentiments, is neither American nor Russian, neither Western nor Eastern. DeMent dedicates the album to her adopted daughter, who came from Russia, as a kind of amends for having taken her away from her own country—a dilemma DeMent appreciates, having become estranged from the childhood faith she loved (but thankfully, not its music). Akhmatova, on the other hand, famously stayed to suffer in her homeland while many of her peers were fleeing Stalinism. Exile can be not just spatial or cultural, but internal. Again, how exactly do you choose your name, your form, your life? Or, for that matter, your narrator? Aside from the public fact of their author’s anonymity, Ferrante’s books are built around another absence: They begin with the vanishing of the protagonist Lena’s lifelong friend and foil, Lila, in her late middle age. The story is spurred by the need to comb through their relationship for clues to this central mystery, both of where Lila has gone in the world, and where she resides within the narrator, as a shadow self, a kind of emotionally and intellectually conjoined twin, who has both inspired and enabled who she’s become and on another level discouraged and constrained her. Throughout the books, Ferrante often sounds the dilemma of how women are supposed to live as human beings, rather than as figments who are made up by men. (Newsom makes the same point on Divers’ title track, singing, “A woman is alive!/ A woman is alive;/ you do not take her for a sign in nacre on a stone,/ alone, unfaceted and fine.”) This, then, becomes Ferrante’s gift to her characters—that, as girls and women, they can make each other up instead. Such mutual invention can entail a violence of its own. Is DeMent, for example, being true to Akhmatova in translating her Russian verse into American song, or appropriating her? (How would we regard it were Akhmatova not Russian, but Chinese or Nigerian instead?) Is it humility or arrogance for Newsom to disperse herself into the universe—thereby making all the universe part of her in turn, every mote a courier of her song of herself? And in writing Lila’s story, is Lena solving her disappearance, or disappearing her? Love, as all these artists know, is far from peaceful and straightforward; it can be withholding or devouring, and self-love most of all. Yet where in life we may be wary of those who do not maintain healthy boundaries, in art that kind of overstepping has to be licensed on faith—particularly for those, including women, whose subjectivities are seldom permitted otherwise to go gallivanting about unpoliced. A doubleness of voice might be damned as double-talk, which is the kind of resentment that lurks when critics obsessively speculate on Ferrante’s “real” identity (especially those who insist she is a man), or treat Newsom’s prolix imagination as mere pretension. Come out, show yourselves, comes the demand. Submit to verdict and discipline. But displacement, division, forkedness—this is the curse and the gift of tongues that are born of speaking from a minority locale, interior yet expelled, at once observed and observing. Thus the long history of “double consciousness” in black culture, for instance, and queer irony and camp. The mistake would be to think that these special perspectives, these views from nowhere, whether from Soviet Appalachia or the clouds above the wildflowers, disclose only a specialized, identity-based truth. In fact it’s that very slant that discloses existence in all its many, oft-bypassed dimensions.